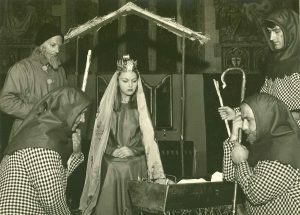 The village of Aldermaston has put on a Nativity Play in the parish church of St Mary the Virgin every year since 1957. The play is an adaptation of 8 or 9 plays from the 400 year old York Mystery Cycle plays that tell the story of the first Christmas. 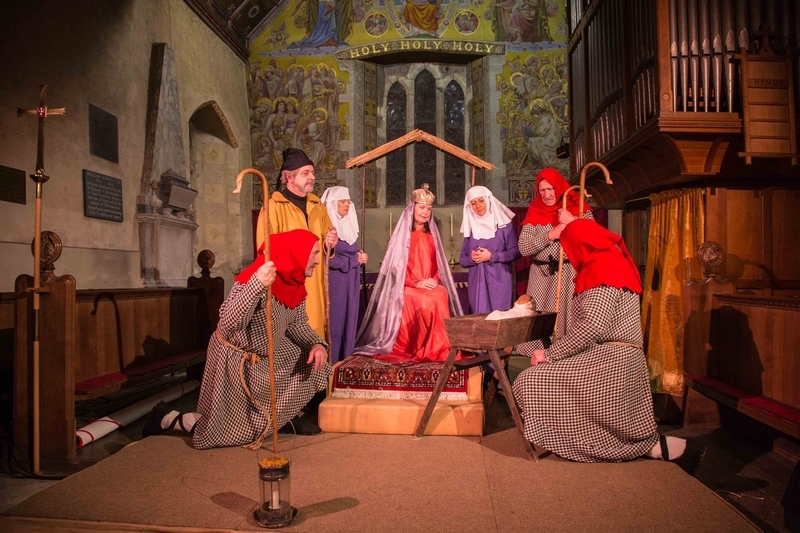 The Aldermaston staging of the York Nativity Play was the brainchild of Revd Canon Stanley Young, the vicar of Aldermaston, and Pat Eastop, a local mother and teacher who had studied Medieval Art. Pat went on to direct the play for 57 consecutive years before her death in 2014. She was awarded an M.B.E. This version of The York Nativity Play Cycle was made in 1930 by E. Martin Browne. The text was revised in 1952, after E. Martin Brown’s experience in producing the York Mystery Cycle Plays. It is this 1952 edition that we perform at Aldermaston. Martin Browne had a long career in religious drama He produced the revival of the Mystery Plays in York in 1951, 1954 & 1957. It is likely that E Martin Browne used a copy of the manuscripts published in 1885 by Lucy Tomlin Smith. 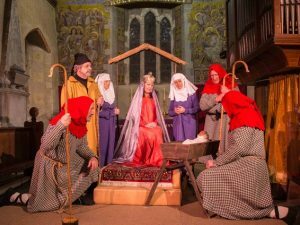 The adaptation if of 6 of the Mystery Cycle plays to form a single Nativity Play for a performance in a church with multiple staged areas. 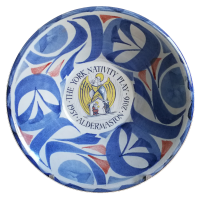 The text was adapted from the translation of the York Mystery Plays.